Available in Two sizes; Large £55 and Small £45. Ashes, Earth soil or Sand is lovingly infused into a stunning coloured 'Glass Bar' Eternity Bead. Beautiful Cremation-Glass memorial keepsakes, In aid of 'The NCTLC Trust'. 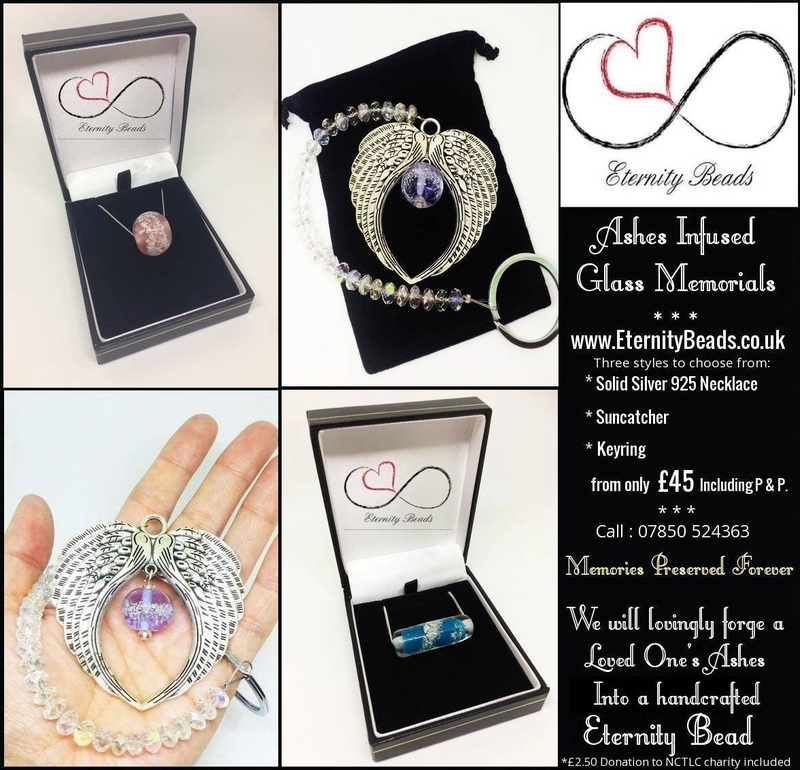 Encasing a Loved One's cremation ashes into a large lampwork 'Eternity Glass Bar' including an 18" solid silver curb chain or key ring and presentation box. £45 The 'Original' Eternity Bead. 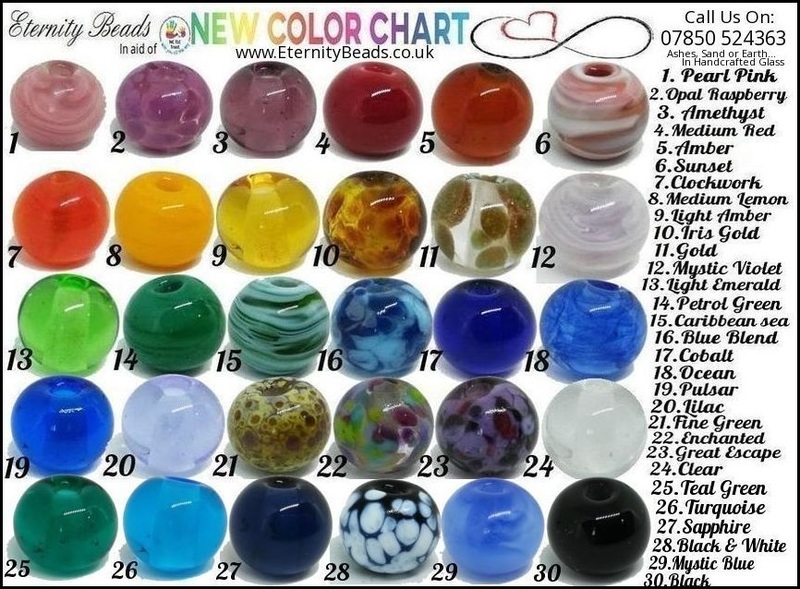 Ashes, Earth Soil or Sand is lovingly infused into a stunning coloured Round Glass Bead. 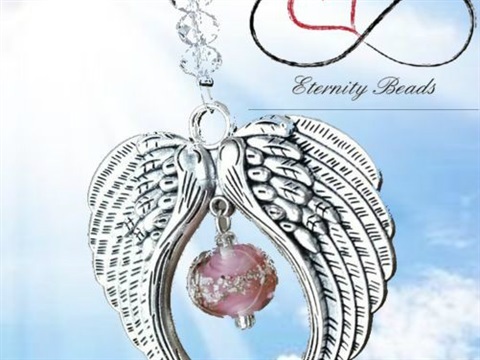 £45 Our Eternity Bead Sun-catchers will perfectly present your Eternity Bead for you once placed in a bright window and will catch the sunlight beautifully. 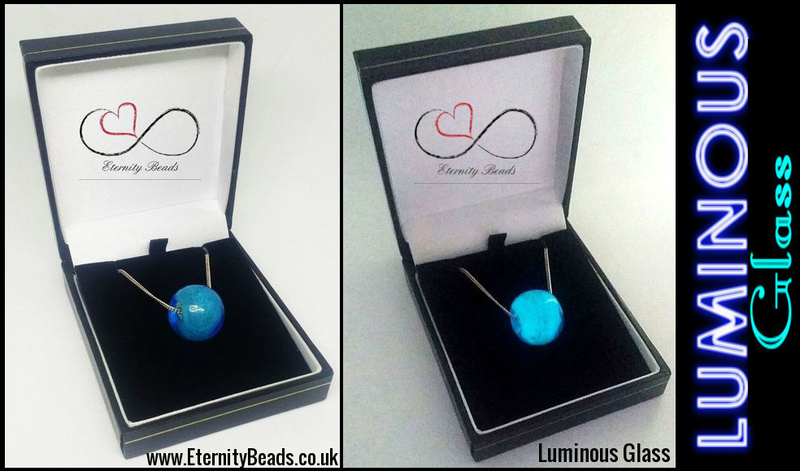 If you choose a 'Luminous Blue' Eternity Bead it will store the sunlight during the day and glow Blue at night. They each come with a velvet bag and free Postage and Packing. *Only Round/Original sized beads will fit in the sun-catcher. 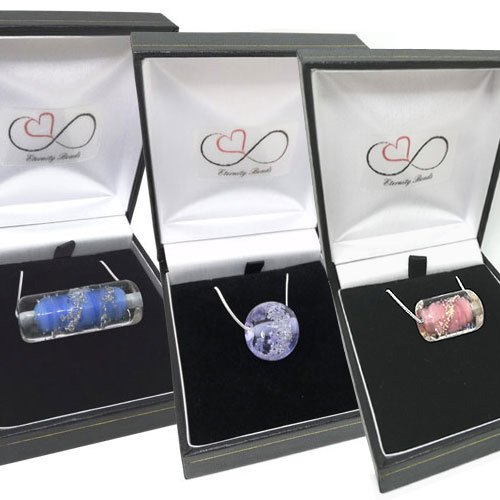 We are specialists in the design and creation of fine quality personalised Ashes In Glass Jewellery and Keepsakes. Call Eternity Beads on: 07850524363 And Discuss Your Requirements With Us Today. We handcraft very fine quality personalised glass jewellery incorporating the ashes, earth or sand from a loved one or a special place. 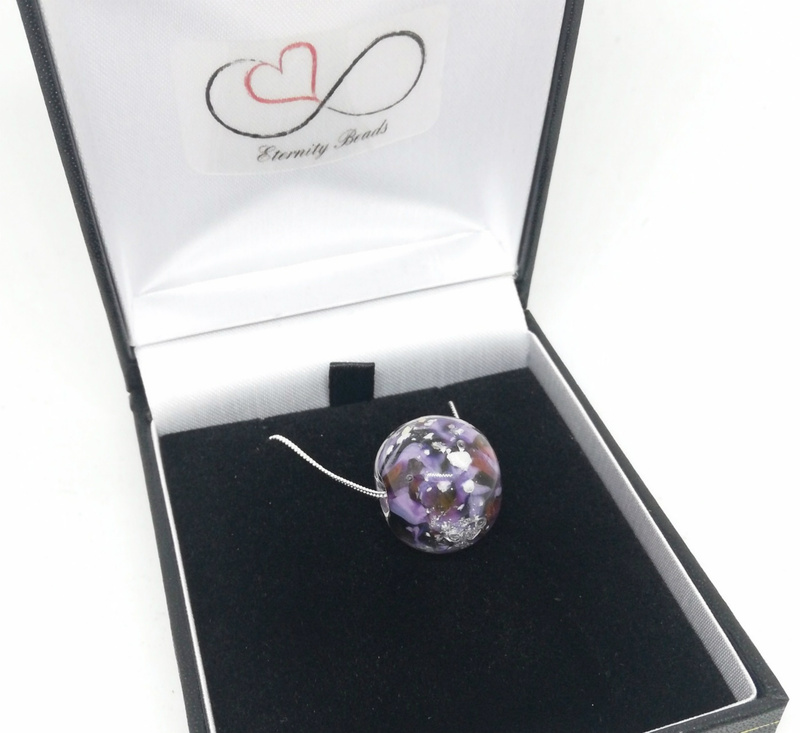 We have built a trusted reputation thanks to the wonderful reviews kindly left by our clients who praise us for keeping them updated, once we received their loved one's ashes, and again when their Eternity bead was ready to return home to them. We are working to raise funds for the charities we support by crafting the highest quality ashes in glass memorials available, and helping those experiencing loss. Current crafting/delivery time is two weeks from us receiving the ashes. Celebrate 'The NCTLC Trust's 10th Anniversary', Helping families who have children with cancer www.NCTLCTrust.com by sharing our links. 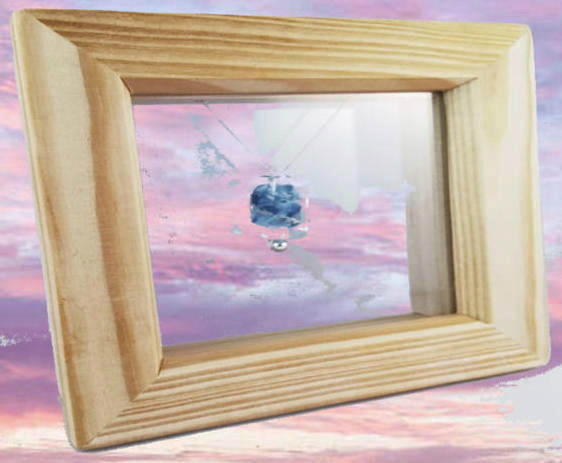 *Eternity Beads Exclusive* £45 Wooden Frame with Small Bar Eternity Bead mounted on a Sterling Silver chain. 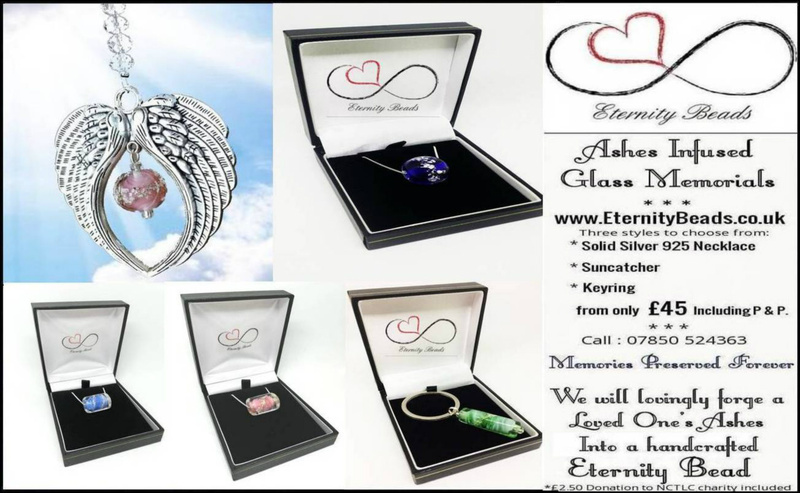 Your loved one's ashes lovingly preserved in a beautiful handcrafted glass memorial keepsake mounted on a 925 Sterling Solid Silver Chain with 925 Silver bead. 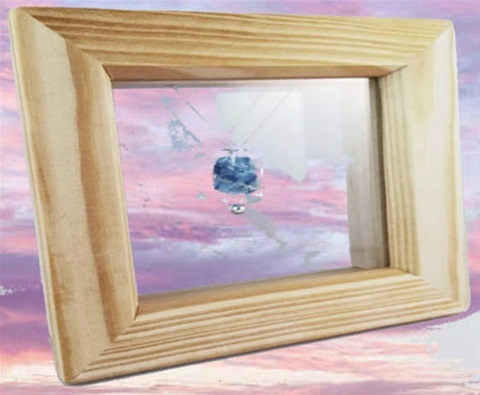 This deep wooden display frame with glass front and back (12cmx12cmx3.5cm) is self standing or can be wall mounted. Only available from Eternity Beads. In aid of 'The NCTLC Trust'. 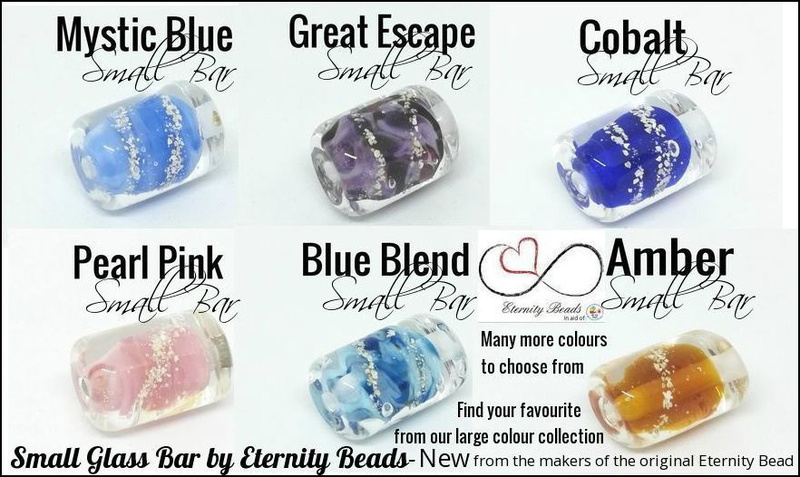 Eternity Beads are also available in the 'Eternity Large Glass Bar' and 'Small Glass Bar' designs, exclusive to Eternity Beads. Inspired and created by glass-artist and co-owner Cheryl Winterflood. We have the utmost respect when crafting all our beads which takes place in-house at our 'Glass Butterfly Studio' in Wellingborough, Northants by our sole artist and co owner Cheryl Winterflood. Prescision, care and respect is bestowed onto the creation of each Eternity Bead. We feel very honoured to be trusted by you to craft your memorials with your treasured loved one's ashes. All ashes are returned to you and we will only use as little as we can. 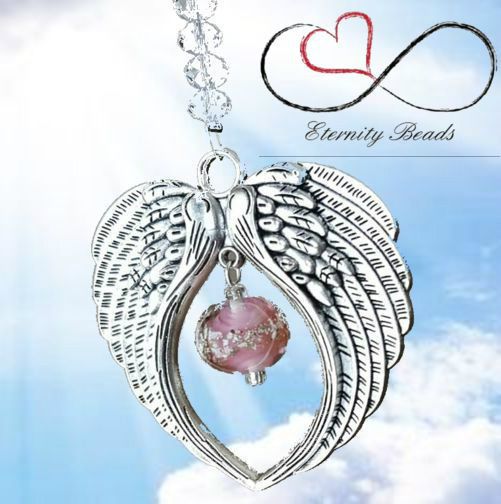 Be it the cremation ashes of a loved one or the beach sand from your childs first holiday.... An Eternity Bead will safeguard your treasured memories for you to keep close to your heart. We are very conscious that it means alot for our customers when we let them know as soon as we have received their ashes, and again once we are ready to send them their finished keepsakes. We consider this an important part of our service for you. 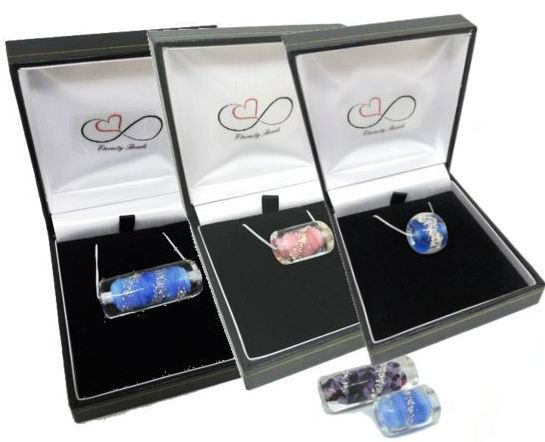 Every 'Eternity Bead' includes an 18" solid 925 sterling silver chain, Sun-Catcher or a key ring, and leatherette presentation box. 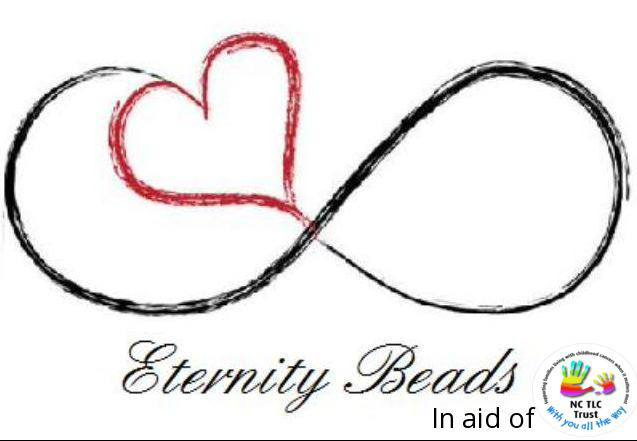 £2.50 is donated to 'The NCTLC Trust' charity for every ashes Eternity bead we make for you. Please share our website and The NCTLC website. Your purchase includes a donation of £2.50 to help families living with cancer. 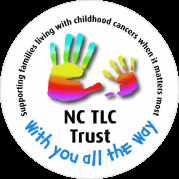 The NC TLC Trust is a Northampton based children’s cancer charity dedicated to supporting families living with Tumours, Leukaemia and other cancers. They provide practical and emotional support from the point of diagnosis. 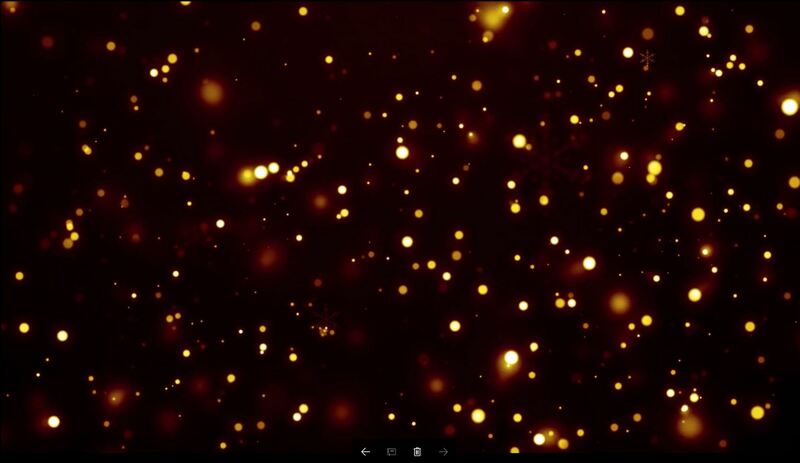 Our new Luminescent Glass collects light and will glow in the dark. Available in Beautiful Blue which glows an iridescent Turquoise. 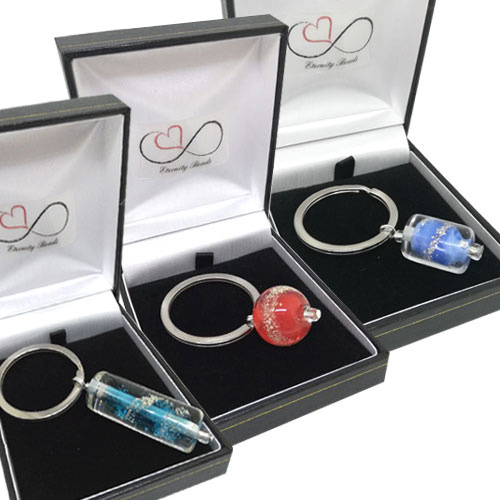 Every Luminescent Eternity Bead comes with a Free U.V Torch keyring to charge up your Eternity Bead and make it glow brightly. 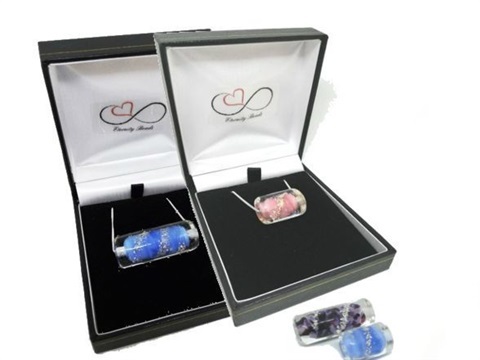 When you order you will receive our 'Eternity Bead Pack'. 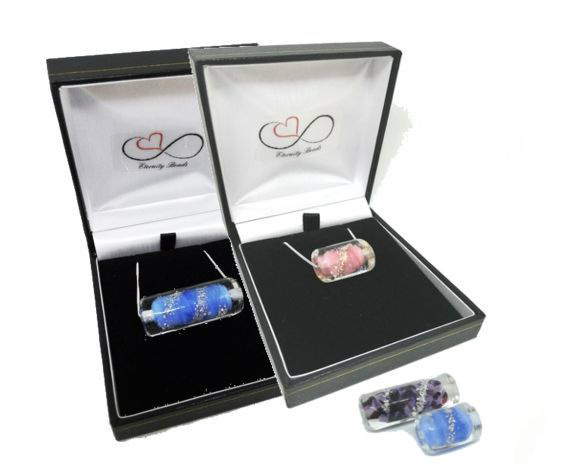 This will include everything you need to send us either ashes or sand for us to preserve inside your glass bead. When your Eternity Bead Pack arrives you will find inside: a stamped addressed envelope, a vial for sand or ashes and also a simple form to choose which of our colours (see Colour Collection) you would like for your new Eternity Beads. Order Your choice of Eternity Beads from our Online Store page and let us help to preserve your treasured memories today. We are also always available to contact via Facebook Messenger and we would love for you to post photos of your New Eternity Beads there to tell us what you think of them.